Ornate box turtle; photo by jennifernish on Flickr (noncommercial use permitted with attribution / share alike). There are only two species of land-dwelling turtles that live on the American Great Plains (the ornate box turtle and its close cousin, the eastern box turtle). The ornate box turtle prefers prairies and pastures over forest; it is found from South Dakota to southern Arizona and the Rio Grande valley (the Mississippi river generally marks the eastern boundary of its range). 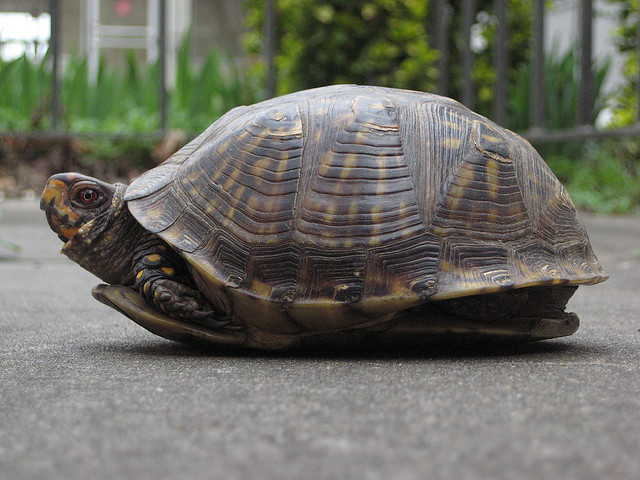 It is illegal in Kansas to take turtles from the wild to keep as pets. Unlike the state reptile of New York (the snapping turtle), the ornate box turtle can completely withdraw its legs, tail, head and neck into a sturdy shell, which protects the turtle from predators such as coyotes, raccoons, and foxes. 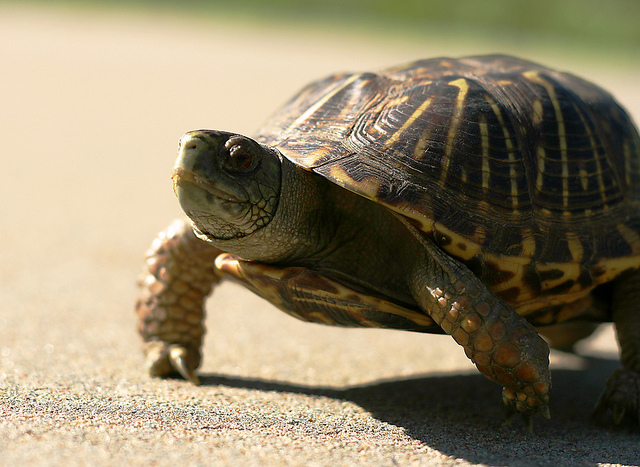 The shell can not protect ornate box turtles from vehicles however - if you see a box turtle on the highway, please stop your car and gently place this unique animal on the side of the road in the direction it is traveling. Active between April and October, an ornate box turtle usually spends its entire life within an area of only a few acres. It's diet consists of insects, spiders, worms and some vegetation such as berries. The female is slightly larger than the male. She digs a hole early in the summer to lay 2-8 white eggs and then abandons the nest. The quarter-sized babies hatch a few weeks later and fend for themselves. In fall the ornate box turtle digs a shallow hole to hibernate in. According to the U.S. Forest Service; "The primary conservation threats to the ornate box turtle include: 1) the destruction, degradation, and fragmentation of its grassland habitats; 2) declines in population sizes due to collection by individuals and for domestic& and international pet trade; and 3) road mortality and other anthropocentric (human) effects." Ornate box turtles are protected in Colorado, Iowa, Indiana, Nebraska, Kansas, and Wisconsin (and international export has been prohibited).